Participation in the School is subject to a competitive selection. Therefore candidates should not make firm travel bookings before they have been notified formally by the organisers that they have been accepted. On October 14 we will arrange transportation (Shuttle buses) from Fukuoka airport and Hakata station to The LUIGANS Spa & Resort, where the school is held. Those who will be coming to The LUIGANS Spa & Resort by themselves may follow the instruction given at http://www.luigans.com/en/access/ . 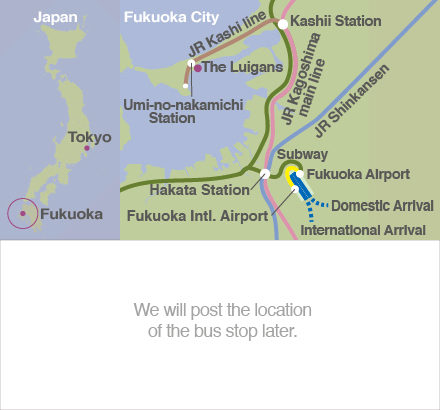 When using public transportation from Fukuoka Airport, refer to the information below. 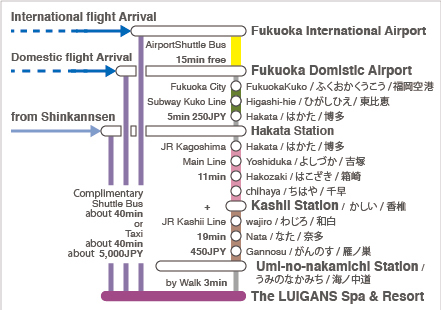 1.From Fukuoka Airport International Terminal, take an airport shuttle to the Domestic Terminal (15 min.). 2.From Fukuoka Airport Domestic Terminal, take Fukuoka City Subway, Kuko Line and get off at Hakata station (2nd station/ 5 min.). 3.From Hakata station, take JR Kagoshima Honsen Line (track No.1-4) and get off at Kashii station (4th station / 11 min.). 4.Transfer to JR Kashii Line and get off at Umi-no-nakamichi station (4th station / 19 min.). 5.From Umi-no-nakamichi station, it is about a three-minute walk to The LUIGANS Spa & Resort. Lectures on October 21 (Sun) will be held at Hakozaki Campus, Kyushu University. Transportation from/to The LUIGANS Spa & Resort will be prepared. Those who will be coming to Hakozaki campus by themselves may follow the instruction given at http://www.sci.kyushu-u.ac.jp/e/html/map/map.html.